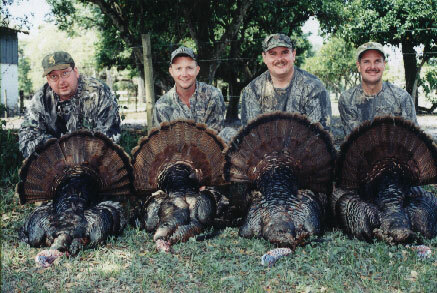 Osceola Outfitters, Osceola Turkey, Wild Boar, Alligator and Whitetail Deer Hunts! Osceola Outfitters offers outstanding hunting opportunities for Osceola Turkeys, Wild Hogs, Whitetail Deer and Alligators. These hunts take place on a working, fifth generation Florida Cattle ranch that is rich in history. As you hunt you will experience what Florida was truly like before the days of mass urbanization, having preserved the natural beauty of Florida's untamed wildlife. Game limits in the state of Florida are liberal due to the vast amounts of game, yet, Osceola Outfitters is still recognized in central Florida as having exceptional game populations. In addition, we are well known for our trophy game management programs that consistently produce large trophy class animals in all species hunted. As you hunt in the natural surroundings of palmettos, cypress swamps, and pines, you can observe eagles, sandhill cranes, and various waterfowl, just to name a few. Osceola Outfitters is centrally located just a short drive from most of the Central Florida attractions like Disney World and Sea World. This may be good to keep in mind the next time you are considering a family vacation.